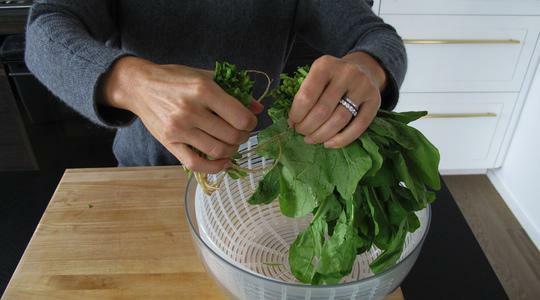 Remove and discard the tough stems from the arugula and put the leaves into a salad spinner. Add the mint leaves as well. Wash and spin dry. Set aside. Set up your breading station: Get out 4 dinner plates and 1 shallow bowl. Place the flour on one plate. 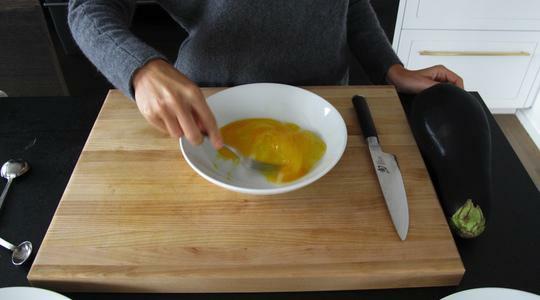 In the shallow bowl, beat the eggs with a fork. 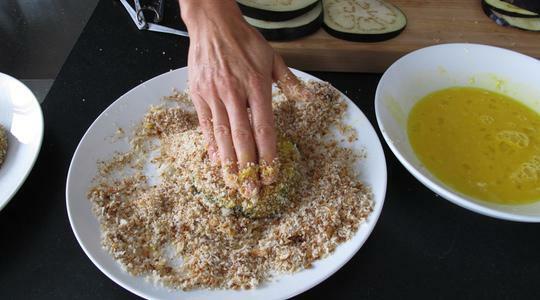 On the second plate, combine the bread crumbs, salt, and pepper (12 turns on a pepper mill). 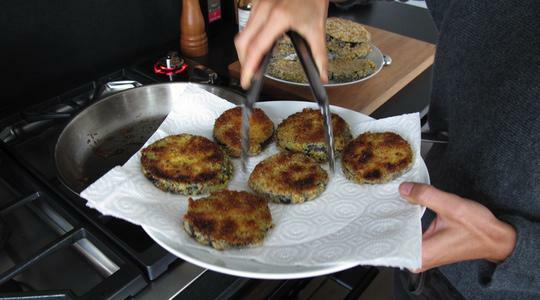 Place a clean plate nearby for the breaded cutlets and top the last plate with paper towels. 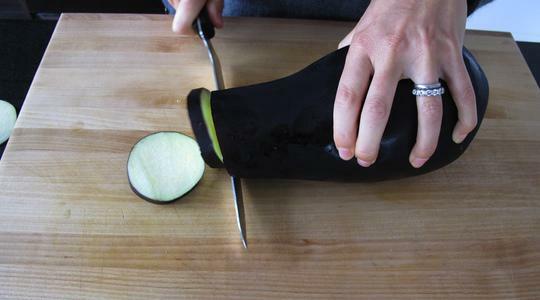 Peel the eggplant, if you like; otherwise just rinse it and pat dry. Using a serrated knife, slice off the stem and discard. 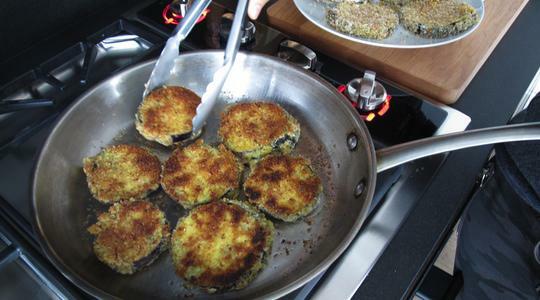 Slice the eggplant into about 3/8-inch thick rounds (or somewhere between ¼ inch and ½ inch). 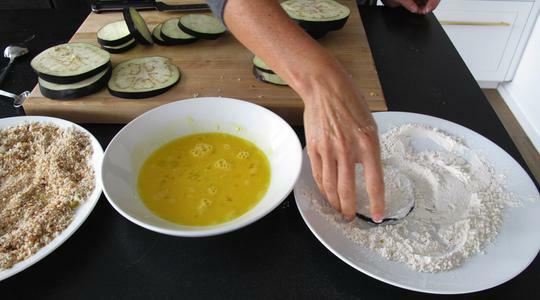 Using one hand, dip each round in the flour, then in the beaten egg. Let the excess egg drip off before finally dipping into the bread crumb mixture, pressing to help it adhere. Place the rounds on the clean plate. Set a large skillet on the stove and turn the heat to medium. Measure and pour in ¼ cup of the oil and heat until it shimmers (about 1 minute). 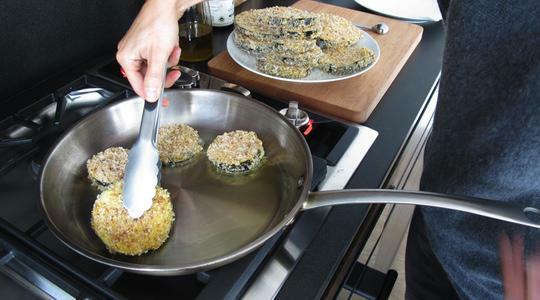 Using tongs, add as many rounds that can fit in one layer (they should sizzle) and cook until the undersides are golden brown, about 3 minutes. Flip them and cook until golden brown on the other sides, 2 to 3 minutes more. Transfer to the paper towel–lined plate. Wipe out the skillet with paper towels. 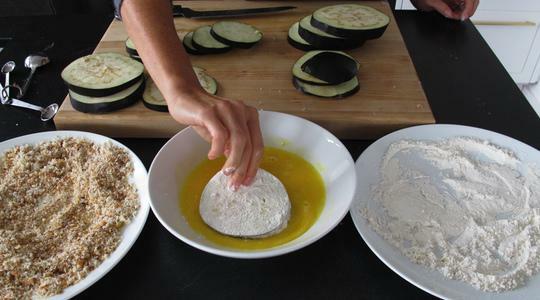 Repeat with the remaining eggplant and oil. 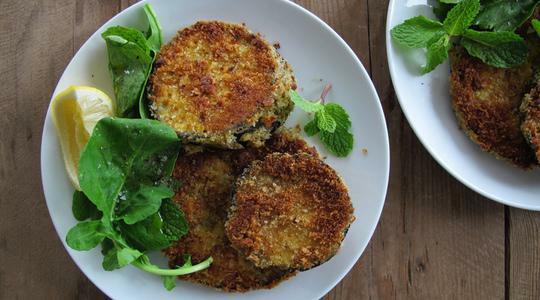 Divide the cutlets, arugula, mint leaves, and lemon wedges among plates. Drizzle the arugula with a little oil and sprinkle on a tiny bit of salt and pepper to taste. Squeeze the lemon over everything!